Meet the Blunt XS Metro + Tile, the first location-aware umbrella. If you lose track of it, just whip out your iPhone (an Android app is in the works) and fire up the Tile app to track it down. As you close in on its location, the umbrella will play a tune so you can locate it with your ears as well as your eyes. First, about the umbrella itself. It’s a Blunt, which means it has a patented tension-release button. You push and the collapsible umbrella pops out, no fuss. It’s available with red, blue, or gray accents, and it costs $69, which is actually a bit cheaper than other Blunt models (so you’re not paying a premium to get the added utility of being able to track it down). Drop $69 on an umbrella and you'll definitely want to keep track of it. 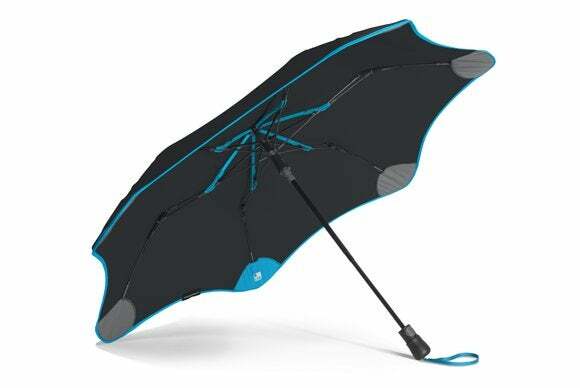 The umbrella is made from a tough polyester material. It measures just 14 inches long and weighs only 0.82-pounds, yet folds out to offer 900 square inches of protection from the elements. In other words, it’s a capable, quick-release umbrella you will love. I danced in the rain with it a few times and had no problems keeping dry. The XS Metro feature we’re most interested in is hidden inside a small interior pocket near its outer edge: a Tile chip. 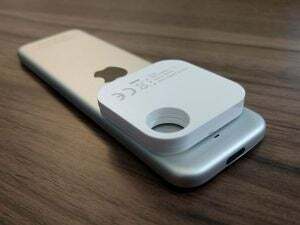 About the size of a quarter, the Tile uses Bluetooth low energy to communicate with your phone. I like the Tile because it’s very small and its app is simple and very easy to use. It will track up to eight Tiles, so you can attach them to other things you tend to lose tracks, such as your car keys or the remote control. A Tile chip like this is stashed in a tight pocket at the umbrella's outer edge. I installed the Tile app on my iPhone 6 and pressed the letter “e” on the Tile chip. It played a tune as it synched to my phone. I labeled the Tile (and the object it was attached to) “Umbrella” and took a photo of it. The part of the fun of testing a gadget like this is purposefully trying to lose it. I asked a family member to go stash it somewhere to see if the Tile location tracker worked. Once they’d hidden it, I opened the app and pressed Find. The Tile began emitting an undulating chime in a crescendo/decrescendo pattern. It’s not obnoxiously loud, but you can hear it easily from a hallway if your wayward umbrella is stuffed under a bed. Don’t expect whole-house coverage though. It uses Bluetooth low energy to preserve its battery life, so the Tile’s range is only 50 to 100 feet. Its signal wasn’t strong enough to reach my iPhone when I was on a different floor of the house than the umbrella was. Tiles are great for locating lost things. Tag your umbrella as “lost,” and the app will notify you when you come back into the Tile’s range. If you just leave it behind somewhere, you can locate its last known location on a map. In Orwellian fashion, you can also search for your missing umbrella by tapping into the phones of other Tile users. Tile tells me this happens without those users’ knowledge, but that they consent to it when they agree to the app’s terms of service. I really like the Blunt XS Metro + Tile. If you’d prefer to keep track of a more traditional “stick” umbrella, check out the Blunt Classic + Tile for $99. A Tile’s battery lasts about one year and cannot be replaced—you just buy a whole new Tile (currently priced at $25, with discounts if you buy in quantity). But don’t forget that buying into the Tile ecosystem means other uses will be able to use your phone’s resources to track their missing stuff, too. Blunt makes great umbrellas, and accommodating a Tile reduces the likelihood of your losing track of this one.